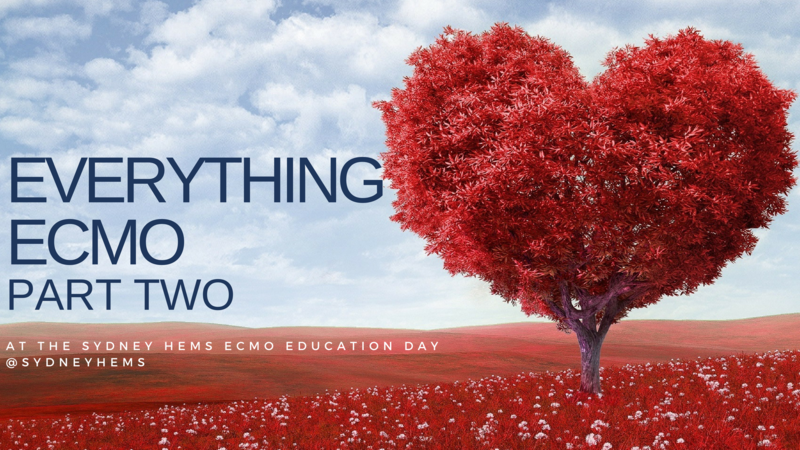 This second post from the Sydney HEMS ECMO education days summarises a great session by Retrieval Doctor and all-round legend Natalie Kruit on Troubleshooting in ECMO Retrieval. What’s the role of the Retrieval Doctor? As mentioned in Part One, the retrieval doctor is essentially there to look after the patient as a whole, while the separate ECMO team will oversee the function of the ECMO pump. The first thing to know as a retrieval doctor is that the pump is primed with crystalloid – there is approx. 1L in circuit in total – so we should expect patients to be a bit unstable after transition onto pump! There is an access line in or near vena cava – this draws blood into the pump. This is the negative pressure part of the circuit. Blood drains into centrifugal pump, is oxygenated and is returned to the right atrium. Pathologies that will do well: asthma, ARDS. The longer they’ve been on a ventilator, the less likely they are to do well on ECMO. What can you as the retrieval doctor do? This occurs when the vein the cannula is sitting in is collapsing around the cannula. If bleeding: TXA, FFP, platelets (prepare to do an ECMO circuit change as may clot) – don’t give protamine (you will get clots and that is maximum badness! The circuit may not be able to capture full cardiac output, so some deoxygenated blood is circulating. Preferentially this seems to go to the brain and heart. This can happen in someone whose circulation is hyperdynamic (eg sepsis, morbid obesity). The drainage cannula is a good determinant of flow (a bigger drainage cannula gives better flows). You may see a low arterial SaO2 and high access cannula SaO2. There are two different cannulation options for VA ECMO. You’ll get some mixing of the deoxygenated blood from the ventricle with the oxygenated blood from the ECMO circuit – the more contractile the ventricle, the more distal the mixing point. There’s a nice interactive critical care case here that covers some of this. If the lungs are not working and the heart is starting to recover and therefore has some recovering ejection fraction, the heart will preferentially eject to coronary and cerebral circulations (so check the ECG for signs of cardiac ischaemia) – it’s also helpful to have a SpO2 probe on right hand to see differential hypoxia early. In this scenario the heart is pumping (so there is a native cardiac output) and that is picking up and distributing deoxygenated blood that we can’t capture with ECMO flow. You may see demarcation of skin tone change across the trunk and/or the ECG may show ischaemic changes. There’s a nice diagram here which comes from this open access paper in Circulation (clicking the link will download the PDF). When severe end organ damage has occurred (e.g. AST/ALT very high, lactate >10 and not clearing) we have missed the boat! If you work for Sydney HEMS, take a look at the new ECMO class available through the virtual learning environment. A/Prof Forrest talked a little bit about VA ECMO in sepsis. The key to the septic shock definition is MAP 60mmHg (or inotropes required to keep it here). Most adults dying from sepsis do so in a high output state (increased cardiac output with decreased systemic vascular resistance): this paper from 1984 looked at 20 patients with severe septic shock – 50% had moderate to severe decrease in left ventricular function. Notably they found the left ventricular ejection fraction had returned to normal within ten days in those who survived. This leads us to consider whether low ejection fraction might be a good thing in patients with septic shock – this review by Vieillard-Baron et al from 2001 seems to support the hypothesis. MacLaren et al described their experiences with VA ECMO for septic shock in children. They looked at 45 patients, of whom 21 survival (47%). In terms of central vs peripheral VA ECMO, survival proportions were 73% vs 44% and no survivors severely disabled. The authors felt that their data suggested that central configuration might provide a survival advantage. The same team published a further paper in 2011: in this paper they studied 23 patients, 17 of whom survived to discharge (74%): they noted that a high lactate predicted worse survival. As a result of this work, the American College of Critical Care Medicine’s paediatric sepsis guidelines published in 2017 include ECMO if the child has persistent catecholamine refractory shock. For adults the data is lacking; literature only describes around 200 adults on VA ECMO when case series are combined and there are considerable different baseline characteristics between patient groups. 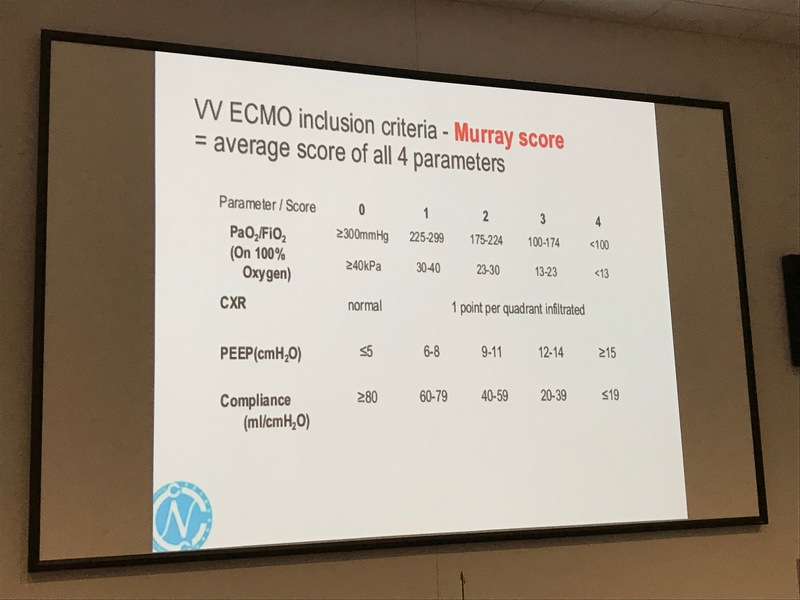 Cheng et al studied adult patients requiring ECMO for the management of sepsis in their paper on predictors of survival: they found that gram +ve sepsis does better than gram –ve or fungal. There is also the possibility (in adult patients) of using V-AV ECMO: this is when a second return line is sited in the internal jugular (or similar) with the aim of providing oxygenated blood to the right heart. The femoral artery is part of a higher pressure circuit than the internal jugular line and it can be tricky to regulate flow between the two lines. As yet there is little data on this: this case series by Yeo published in Critical Care in 2016 reports a 50% survival with this technique for adults with severe ARDS and septic shock. but more evidence is needed. This entry was posted in ECMO, General PH&RM and tagged CGD, ECMO, education, FOAM, FOAMed, learnecmo, Nat Kruit, Natalie Kruit, retrieval, sean scott, sepsis. Bookmark the permalink.